These colors make me want to curl up next to a warm fire with a big glass of red wine, a good movie and loved ones. The perfect recipe for a Friday night. Happy Weekend! 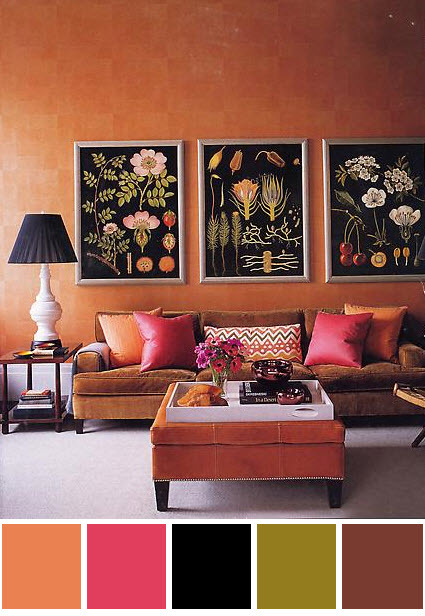 Great sofa and fun color palatte! I am really into the framed art. I think we need another wine night soon! LOVE the color palatte. It would go great with the bird pillow I obsessed over and finally got! :-) Yes, I am considering redecorationg my living room around a bird pillow. Great colors. Looks so warm and cozy! oh wow yes. so warm and cozy! I can taste the warm caramel color palette. I love the framed art, and those bold colors! Happy Friday Night! Ooo, I see the perfect cocktail party being thrown here. This grouping would be good for an outfit too! :) Love it. Ah, missing my red wine since being preggers. I already told my family that we'll have champagne in my hospital room to celebrate when Baby C gets here in May! !